Flower Arranging at Seaforde W.I. President Jennifer Heenan welcomed everyone to the March meeting on a very wet and blustery night. 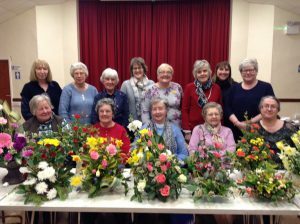 Seaforde member Lorraine Bothwell was the demonstrator for the night and gave members one to one instruction on creating floral designs from the array of flowers present. Everyone went home with their own work of art. The monthly competition was a bud vase with Margaret McCall being judged the winner, 2nd Helen Newell and 3rd Eileen Milligan. The birthday girl was Jennifer Robinson and Cilla Green won the ballot. The Institute’s Annual Charity Quiz at the Lakeside in February raised £429.20 which will be donated to Rural Support. The quiz team of Margaret Broome, Cilla Green and Susan McDowell and reserve Elizabeth Fleming took first place at the Area Quiz and will now go on to represent the Quoile Area at the finals. Congratulations were also extended to Margaret McCall, Pam McDonagh and Kathleen Heenan who are members of the Area Choir for their outstanding performance at the music festival, gaining two firsts, two seconds and first overall. The Quoile Area meeting will take place in Seaforde on Tuesday 30th April when the speaker will be Mr Brian Gault. President Jennifer Heenan gave the vote of thanks to Lorraine and brought the evening to a close.